Learn more about the support available. There are more than 11 million people currently living with a disability, impairment or limiting long-term illness in the UK, but what support is available? Living with a disability can be an incredibly long journey, physically and mentally, both for the individual and the people who live with and/or care for them. But there is help and many resources available – you just need to know what to look for. The first step is knowing when an extra hand may be needed. 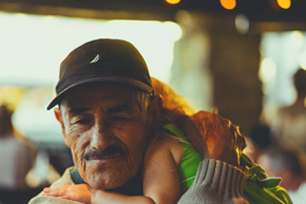 If you are unable to work, there are many benefits available, as well as people to help you claim for them. The NHS also provides a range of support services to help you and your loved ones manage the disability. If you are a student at school, college or university, your student services team should be able to offer help and support throughout your studies. If you care for someone with a disability, there is also support available for you. Particularly in severe cases, it is important for you to rest and take care of yourself too. Find out more about carer support on our dedicated fact-sheet. Disability counselling can be helpful for many reasons, sometimes you just need to talk, while other times you may need professional guidance. If you’re suddenly classed as disabled, due to an accident or a serious health condition, such as cancer, counselling may help. Speaking to a counsellor can help you understand the changes going on in your life, as well as simply providing some of the support you need. They can also help you know your options. Living with a disability can often lead to financial hardship and low social support. These experiences can then lead to mental health problems, such as anxiety and depression. 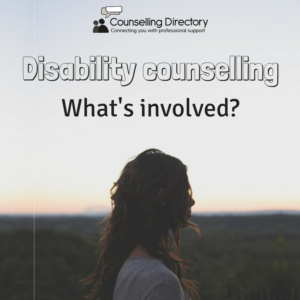 Counselling can help you address these issues, as well as teaching you coping techniques to help you adapt to the changes living with a disability can bring. If you have a disability or care for an individual living with a disability and would like to speak to a professional, you can find a counsellor near you using our advanced search tool. We understand that reaching out and seeking help can be a daunting process, but we’ve tried to make it as easy as possible. You can learn more about disability and carer support on our fact-sheets and research our counsellors until you find someone you resonate with. We encourage our members to fill their profile with as much information as possible, so you can understand how they work and if they are right for you. Remember you are not alone and support is available, you just need to take the first step.